Nile, capturing shots of nesting egrets, cranes and swans. artisan tiles, heated towel racks and a floating vanity. your appetite for customized, supreme efficiency. fast becoming the talk of the town. including a huge weekend flea market. HBO, Showtime, Starz, Cinemax, EPIX, On Demand, and Netflix! Bedrooms both have flat screen TVs, full cable. DVR in master bedroom. Whole-house DVR playback box in second bedroom 2. We are right on the Esopus Creek. Kayak the creek to see the Catskills as the original Native Americans did. Central Air Units Hot/Cold with remotes in each room Additional oil furnace with easy dial thermostat. 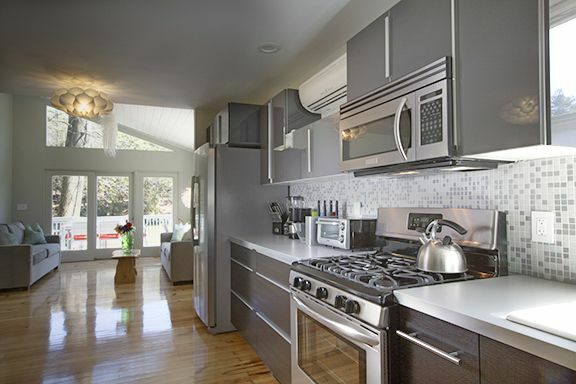 'Stylish, Modern, Comfortable Design Sprawling chef's kitchen with stainless steel appliances. Gas 5-burner stove with convection oven. Full HD 120 Channel Cable Package with Premium Channels including HBO, Showtime, Starz, Cinemax, EPIX, On Demand, and Netflix! high speed internet wireless. Full HD 120 Channel Cable Package with Premium Channels including HBO, Showtime, Starz, Cinemax, EPIX, On Demand, and Netflix! Stayed here post Sheep & Wool to explore more of the Catskills and HRV areas. We loved the location on the creek, and it was a perfect home base. The cottage was modern, clean, and very cozy. Lots of attention to a guest's needs and comfort. We appreciated the groceries and wine, radiant heat flooring, heated towel rack, and the luxurious beds and bedding! Steve was a pleasure to work with, and fast to answer questions. Thank you! Our stay at the home was unforgettable. The design, layout and furnishings were all beautifully done. The view was spectacular. One of the nicest experiences was our contact with the owner and his niece who did everything they could to make our stay special. First class operation, we look forward to our next trip there. Beautiful location! Wonderful amenities ! This sweet home in Saugerties, NY was the perfect spot to relax and unwind for a few days! It is beautifully decorated and VERY clean. The kitchen and bathroom were both well-stocked (liquid hand soap, lotion, fluffy towels, plenty of glassware/dishes, etc.) and the delicious treats left in the refrigerator were such a special touch! The bed was super comfortable - perfect for sleeping in late:) The view of the Esopus Creek (just steps from the back deck) was so peaceful. Though it was chilly when we visited, we bundled up and enjoyed the view and cocktails from the Adirondack chairs out back. We enjoyed a hot Nutella chocolate at the coffee shop in downtown Saugerties and had a great lunch at the Diamond Mills Tavern nearby. Steve was super accommodating and easily accessible. We truly appreciate those that are willing to open up their homes, to both people and their pets. Thank you so much for giving us a chance to see parts of NY we've never seen. We'd love to come back again! Wonderful guests! We enjoyed having you stay at the house. The most relaxing weekend we've ever spent! Will definitely return soon!!! The house looks exactly like the pictures; very clean, well stocked, beautifully decorated home. The views from the deck and the peacefulness while standing there was amazing!! The house is located on a private street away from any traffic but the shopping area is within a 5 min drive which is very convenient. Highly recommend this beautiful home. We spent 2 nights here, lovely home is a very picturesque location right on the water but still close to everything.The home was well stocked with everything you would need for a weekend get away. We had a GREAT time.